SAM BENNETT CONTINUED his unstoppable form with a third straight stage win at the Tour of Turkey on Thursday. 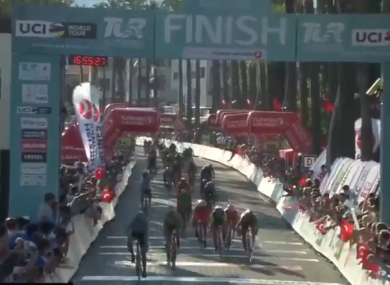 After another excellent ride and lead-out from his Bora-Hansgrohe team-mates, Bennett powered to the finish line in Marmaris to complete his hattrick. The Carrick-on-Suir rider now leads the general classification by 14 seconds ahead of Belgium’s Edward Theuns (Trek-Segafredo) and Simone Consonni of Italy (UAE Team Emirates). Email “Sam's the man! Unstoppable Bennett wins third straight stage at Tour of Turkey”. Feedback on “Sam's the man! Unstoppable Bennett wins third straight stage at Tour of Turkey”.